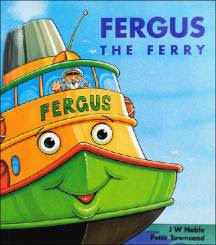 I was approached late last year with an offer to look into Fergus the Ferry. The catch (for me anyway) was that Fergus is an Australian character and the books are not readily available here in the states. Yet, his stories and some games are available on your iPad, iPod and/or your Antroid Tablet. (Stay with me here.) As my readers around here know, I am not remotely interested in getting into the ebook craze, preferring to have old-fashioned books in hand. I was kindly sent all 24 stories in a format which I can hold in my hand. I can turn actual pages. (And I just so like that.) And it is in this fashion that our family has learned to enjoy Fergus. As his title suggests, he is a ferry who is operated by Captain Jim in the Sydney Harbour. As I mentioned, he lives and works in Australia and so throughout the books you pick up bits of Australian geography, wildlife, special holidays, etc. In fact, the reason I was interested in learning more about Fergus in the first place was that I had recently read The Magic Pudding (linked) which boasts an Australian author and I was curious to read more children's stories from that country. Author J.W. Noble wrote the Fergus books for his son, initially, and now they are made available to a larger reading public. All of the Fergus stories are told in rhyme and feature Fergus in a variety of risky situations where he and Captain Jim can save the day and are heroes. They rescue boats and people from storms most usually but have been known to rescue animals being chased by a lion who has escaped from the zoo! Fergus has many friends, including tugboats, helicopters, and bi-planes. He faithfully stays the course, helping steamers, broken down oil tankers and even whales when they are in distress. Captain Jim is sometimes unsure of his and Fergus's ability to save the day but Fergus always pulls through. Each book ends with Captain Jim taking off his hat, scratching his head, shrugging his shoulders and going home to bed. These are very cute little stories and have proven to be quite the hit in our household. Our boys have devoured Fergus. In fact, Bookworm1 mastered the art of reading on these books! They are easy enough for a beginning reader to tackle (with some oversight and a bit of help now and then) and complex enough to keep the reader interested in what is happening. The illustrations by Peter Townsend are bright and cheerful. All of the boats have bright, bold colors and a very cartoonish feel to them which makes them approachable and friendly. 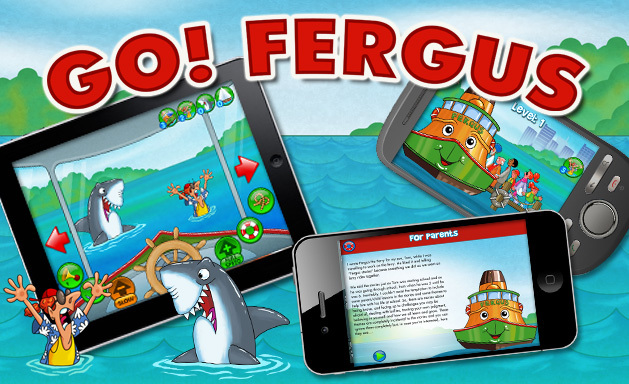 We have been very pleased with our Fergus the Ferry experience and I've no doubt in my head that when my boys do discover there are Fergus games available on the iPad (for yes, I do plan to download them and let them play them) they'll be wild with delight. Fergus is fun and we highly recommend him to you, however you may choose to experience him! Thanks to Snowball Press who took a chance on my family and send us some hard copies of the Fergus books to check out in exchange for our honest opinion. We honestly enjoy Fergus! You're not the only hold out on e-books. I hate them. I was sent an e-book to review and tried. I really did. But reading on a screen just isn't my thing and I need PAPER! lol. I used to be an ebook hold out but I bought a kindle fire before Christmas and now love free ebooks via Amazon. The story sounds very cute, but I I'm holding out too. I need to turn pages. I need to cuddle up with a book. I can't cuddle up with a screen.